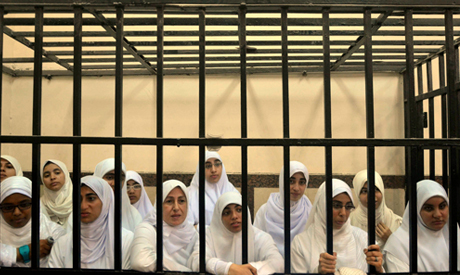 An Alexandria Misdemeanour Court slammed Wednesday 14 female Islamist protesters with 11 years and one month in jail and ordered that seven female minors be placed in a youth detention centre, the lawyer of the accused, Mahmoud Gaber, told Ahram Online. The 21 female protesters who took part in a demonstration late October calling for the reinstatement of ousted Islamist president Mohamed Morsi were arrested during clashes with local residents in the Alexandria. Authorities accused the demonstrators of inciting violence, blocking roads and damaging shop facades. In its ruling Wednesday, the court slammed 14 female protesters with 11 years and one month in jail for destruction of private property, attacking security forces and stirring violence. Six male protesters were sentenced in absentia to 15 years in jail for inciting violence. The court also ordered that seven female minors be placed in a detention centre until they reach the age of majority. The underage girls' ages range from 15 to 17 years. Earlier in November, a court sentenced 12 university students to 17 years in prison over riots at Al-Azhar Institution, stiring criticism over the harshness of the sentence. The students were found guilty of attempting to storm the headquarters of the institution, inciting riots and attacking Al-Azhar employees and security personnel, as well as sabotaging public and private property. They were ordered to pay a fine of LE64,000 each. Muslim Brotherhood supporters have been staging near daily protests calling for the reinstatement of Morsi who was deposed by the military 3 July amid mass protests against his rule. Pro-Morsi protests chanting against the military have often descended into clashes with security forces and local residents with anti-Brotherhood sentiments. Egypt's interim authorities have cracked down hard on Islamists since Morsi's ouster. Large numbers of Muslim Brotherhood members are detained on charges of inciting violence, including the group's top leaders. where r the champions of women rights ? How much time are the people who shot and killed protesters on the streets of Egypt getting? If you ask that question in Egypt today, you will be labeled a terrorist and sent to prison. Dear Editor, The punishment handed down by the Judge is cruel and unjustified. Demonstrating is an act of political expression that is recognized around the world as a right. At most a fine should have been levied but not prison. Unfortunately, it is up to the media like your publication to keep on pressing the government on the evilness of the judgements. There is No Two words Revolutions is necessary Against corrupted Judges ,History one day will remind These young Sisters as Freedom fighters.